By the time the scarab has reached adulthood, it fits neatly in the palm of your hand. 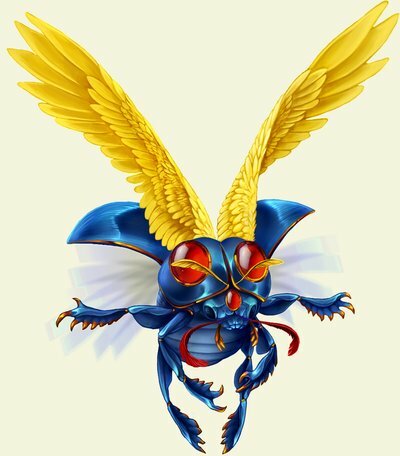 It is richly colored, with a beautiful blue body and golden wings. Bright red marks on its head shine when the sun hits them. Small in size, it is nonetheless a sturdy creature, fearless and energetic. It is able to travel for days without sustenance, though it is capable of finding its own insect meals. It still burrows into earth to sleep and create heat, but now that it is grown, it also makes warmth above ground, and can at times glow very brightly. This is a useful when light is needed, or fires need to be lit in a hurry. You can just imagine what a pack of these beetles could accomplish in a time of need. Luckily, there is no such need, and these scarabs are more than content with their place at The Keep. Surprisingly enough, they have struck up close friendships with the fire gryphons, and the two even go so far as to warm each other. This is rather odd, as scarabs are not social even amongst themselves and form no packs. Unless, of course, they're being chased by a particularly playful cat, at which point a bit of flame reminds the feline rather quickly why these beetles are to be respected. Scarabs are found in the far deserts of Etain, where they burrow deep into the sand at night to slumber. They emerge as the sun rises and spend the day hunting for meals of insects. They can often be seen basking on rocks, and are sometimes mistaken for precious jewels due to their beautiful colors. These colors serve as a warning to predators, as scarabs are incredibly poisonous if eaten. Because of this natural defense their young are seldom in danger from predators, and have no need of their parents. Scarabs lay their eggs in the sands nearest their territories, making finding one a difficult task. These eggs are kept warm by the scarabs' ability to infuse them with warmth. As adults, they master the ability to store heat for cold nights. When living in the lands to the north, scarabs gain energy from fires as well as the sun, allowing them to survive during the winter months. As they approach adulthood they will shed and grow larger and even more vibrantly colored. Discarded scarab wings are highly sought after, as they create beautiful pieces of jewelry, and sell at a high price.